Size: 784 sq.ft. - 1861 sq.ft. Emaar's new residential project in Opera District is the last development launching soon and to be delivered in coming 4 years i.e. in June 2022. The Opera District is a mixed-use development containing hospitality and residential properties. The Grande in Downtown location is going to be the tallest residential skyscraper standing 78 storeys high.Grande Tower comes with a great buying & investing opportunities in the master community of Downtown Dubai. This on-going iconic construction holds you mixture of world class lifestyle with the unmatchable views of Burj Khalifa, Dubai Fountain & other nearby towers from the apartments. The Opera Grande tower is distributed into several stages of premium 1 to 4 Bed apartments and Penthouses. The customers who desire to live in an apartment with legendry surroundings then this project is undoubtly being presented for them. This sophisticated design has contemporary finishes and hugely appreciated by buyers/investors/visitors. The Opera Grande sits beside the Burj Khalifa tower overlooking the unobstructed views of Opera fountain. At the base it has a wide entrance surface, the other top floors consists of restaurants, Shops outlets, cafes and internal amenities for the residences. Every single floor compromises about 4 units with different choices. The second top level of the tower is having Penthouses of 4 Bed and the rooftop of Opera Grande is having a pool built in. The built up are of Grande apartments sized from 731 sq.ft to 1044 sq.ft for 1 Bed, 1130 sq.ft to 1830 sq.ft for 2 Bed, 1861 sq.ft to 3245 sq.ft for 3 Bed and 4 Bed are starts from 2318 sq.ft to 2688 sq.ft. Emaar Properties was founded by Mohamed Alabbar in June 1997. The real estate company is headquartered in Dubai, UAE. Emaar Properties is most admired real-estate firm of Dubai for delivering high standard apartments, hotels, Malls, and commercial offerings. They are also operational in various cities of India in Lucknow, Indore, Jaipur, Gurugram and Chennai. Emaar’s world-class projects include Palm Hills, Palm Terraces Select, Gurgaon Greens, Imperial Gardens,The Palm Square, The Palm Springs, The Palm Springs Plaza, Commonwealth Games Village, Indore Greens, Mohali Hills, Gomti Greens and Jaipur Greens. The year when the company came into existence they continued to develop more than 11K commercial & residential layouts and currently there are about 8500 under construction units. The group has received recognition, has also won many awards and got prized for their excellent vision and execution of work. Grand tower is to be launched soon in the rapidly growing community of Opera District. It is one of the famous districts in Dubai, UAE and there are very less chance to find this kind of upscale lifestyle. Opera Downtown has completely transformed the location by portraying the richness of the city. From the perspective of residential buyers & investors The Opera Grande is a spotlight and the Burj Khalifa as the centrepiece of this district.The Opera Grande is near to the landmarks like Spinneys market, Arab Bank, Rakbank, Burj Khalifa, Metro station, Reem Al Bawadi restaurants and cafe, Dubai Japanese School, Villa police station and Dubai mall. There is alow horizontal building between the other neighbouring towers that adds more scenic contrast around. 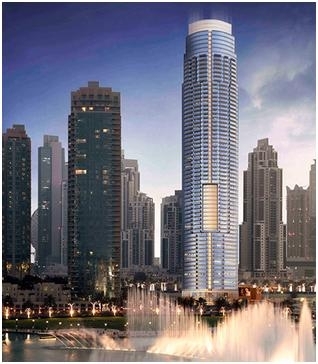 Other than this Emaar have been adding more exciting launches in the Opera district. The Grande is a residential building built next to Burj Khalifa tower at Opera District in Downtown Dubai, Sheikh Zayed Road, UAE. Grande Tower by Emaar Properties comes with a solid collection of excellent amenities featuring Community View, Covered Parking, Fully Fitted Kitchen, Fully Furnished, Gazebo & Outdoor Entertaining Area, Basement Parking, Broadband Ready, Built-in Wardrobes, Balcony, Central Air Conditioning,Marble Floors,Floor to Ceiling Windows, Private Garage, Private Swimming Pool, Gymnasium Intercom, Jacuzzi, Kitchen White Goods and many more.